Each of the 30,000 people running the 2017 Boston Marathon has a unique story. In this mini-series, we’ll bring some of them to light. 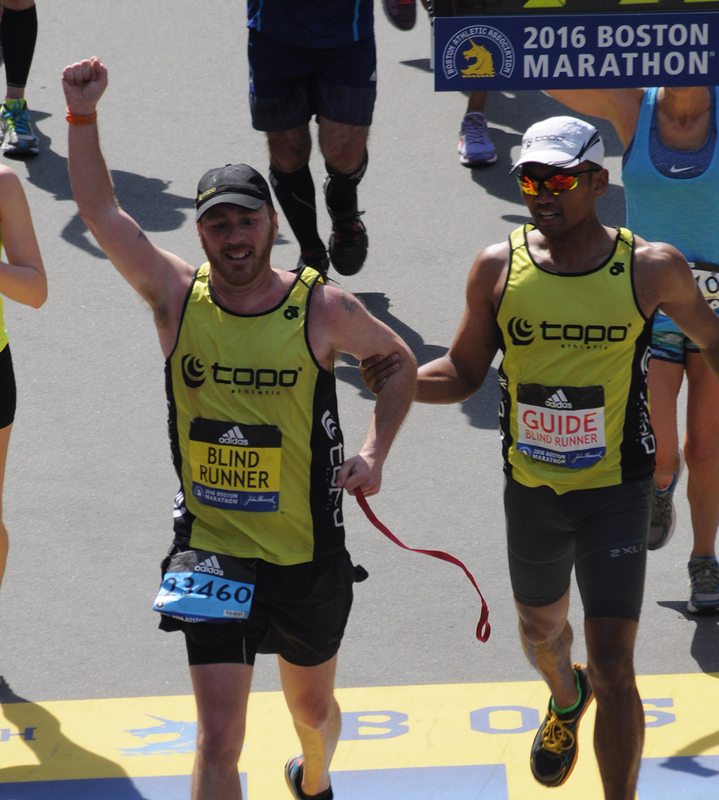 On April 17, Kyle Robidoux will reach the Boston Marathon finish line around 4:45 a.m., hours before a winner is crowned. But his journey won’t be over—it will be just beginning. Robidoux, an ultramarathoner, is running his fourth and fifth Boston Marathon this year, back to back. He’ll start by running the course in reverse, from Boylston Street to Hopkinton. About an hour after he arrives at the starting line, he’ll set off for another 26.2 miles with the pack. This feat would be impressive—or insane, depending on your perspective—for any runner. But Robidoux has an added challenge: He’s legally blind. He can run alone on routes he knows well, but for most trips relies on sighted guides, whom he trains through a program called United in Stride, which matches visually impaired runners with sighted partners. On Marathon Monday, he’ll run with one guide to Hopkinton, and with two back to Boston. So why the twin marathons this year? Robidoux says there are several reasons. One, he’s embarking on a 100-mile race in July, so a double Boston offers valuable training. Two, the act raises awareness for his marathon cohort, Team with a Vision, and for visually impaired runners in general. And three, the stunt will force Robidoux to experience the race in a whole new way. And while Robidoux says he has a few concerns about the undertaking—like refueling properly, and preventing his muscles from stiffening between marathons—he’s not letting them bring his energy down. If you’re interested in becoming or being matched with a sighted guide through United in Stride, click here.